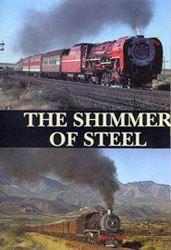 This program features more than 30 classes of South African steam locomotives pulling a variety of passenger and freight trains all around the country during the 1990s. Professionally photographed and produced locally in South Africa by Vidrail, a widely respected railroad videography house, this program brings to you the best of the best action runbys shot over many years. You will witness perfectly composed scenes in early morning and late afternoon light with long smoke plumes and view spectacular mountain and other scenery, all accompanied by awesome live sound. Seven chapters cover: dramatic sunrise and sunset scenes, the Red Devil (4-8-4 #3450) and many other classes on the doubletrack, Kimberley to DeAar speedway; scenic railway lines in mountainous terrain; special runs, the Trans Karoo, coal mines, preserved operations and a host of different locomotive classes in the Transvaal; the preserved George to Knysna line along the Indian Ocean with its seascapes, famous curved bridge, lakes and forests; steam operations at several gold and platinum mines, and a review of many unusual and interesting trains and locomotives in the southern part of the country. This is a very high quality show that you will enjoy watching many times. Those of you who may not like “foreign” steam engines will marvel at how much these are like USA-built power with their excellent proportions, couplers, and loud voices. This program gives you a chance to sample what regular service steam operations in the USA and Canada must have been like. To experience it here with top quality videography is a real treat. Appropriately narrated.